User Defined Comments may be set up to prompt for specific information in the Comment 2 and Comment 3 fields in a reservation or folio. When the user is in the selected comment field a new prompt will pop up. 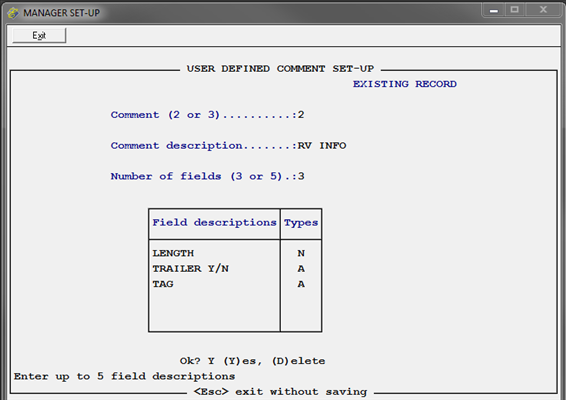 See a sample User Defined Comment within a reservation. If you are using Guest Profile you probably do not need to set up user defined comments since you can specify the field prompts in Guest Profile Tools. Go to Manager/Setup > Hotel Control Files Setup > User Defined Comments. "Comment (2 or 3)" places the comment prompts in Comment 2 or in Comment 3. Enter 2 or 3. you may use both but they must be set up separately. Comment 1 is reserved. "Comment description" is the description of this comment and may be up to fourteen characters. "Number of fields (3 or 5)" sets either three or five prompts when the user is in this Comment field in the reservation or folio. The total number of characters allowed by the user for each comment is 30, whether or not you use User Defined Comments. Entering 3 will allow three fields with ten characters each. Entering 5 will allow five fields at six characters each. "Field descriptions" display for each field in the pop-up on the reservation or folio when the user is in Comment 2 or Comment 3. If you entered 3 for "Number of fields" you may enter up to three separate descriptions. If you entered 5 for "Number of fields" you may enter up to five separate descriptions. Each of these descriptions will display as shown below in the sample User Defined Comment within a reservation. 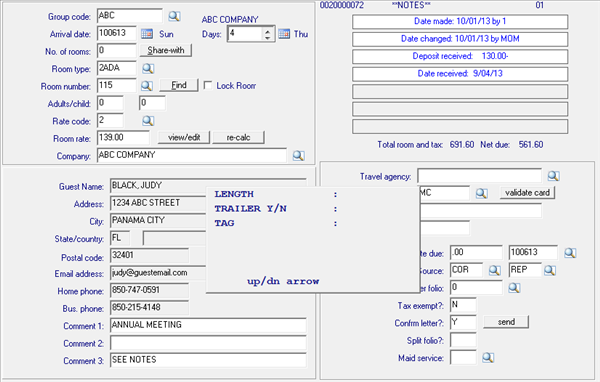 "Types" designates the type of data entry field to apply to each field. Enter N for a numeric field or alphanumeric field, N for a numeric field, or D for a dollar amount. - This sample reservation shows the prompts that display when the user is in Comment 2. The three prompts are LENGTH, TRAILER Y/N, and TAG which are set up for RV Information. The user would then enter the information for each of the fields. Once the information has been entered, the pop-up will close and the user may continue with the reservation or check-in.